When I was in college, I spent my summers cleaning bathrooms at the KOA Campground in Niagara Falls. The money was great but the THINGS I SAW (and had to clean) should never be shared. Needless to say, I became somewhat of a neat freak after that job. I came to appreciate organization, cleaning routines, and a job well done. My skin, however, took a major beating from all the chemical-filled cleaners we used. These days I am older and wiser and only use natural, chemical-free or homemade products to clean my home. Not only does it save me money, but my skin appreciates it, too. 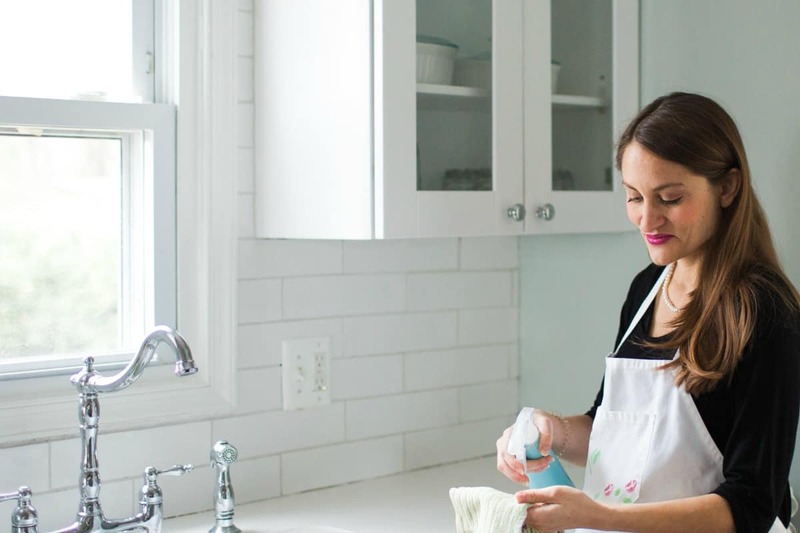 This week I am releasing one of my secret cleaners from the vault – my DIY All-Purpose Cleaner that I know you will love, too. Now, I am not bashing store-bought products. There are some truly great ones out there, many of which I use. 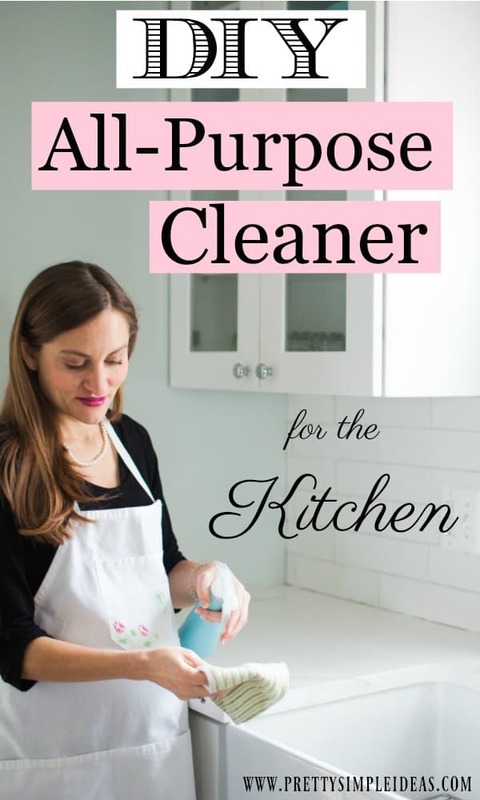 But, I love the fact that I can make my own cleaner on the cheap to use in the kitchen, bathroom, living room, furniture, electronics, and the like. It can go anywhere and everywhere! Plus, I do not have to worry about me, my family or my cat breathing in harmful fumes. Wait, for real? For real. I’d add that they DID NOT find the same decline in men’s lungs. What are we to do? Leave all the cleaning to our husbands! Now, after we have a good laugh, the real solution is to be more conscious about what products we use to clean our homes. For me, the fact that chemical-cleaners caused me to break out was enough without the added risk of lung issues. And like I said, the good news is there are tons of great chemical-free products on the market now, and it’s even easier to make your own. And now friends, it’s time to collect our ingredients and make the cleaner. Shake well before each use. So, you may have noticed a few asterisks. *First, you should probably use a glass bottle because it preserves the essential oils better. **Second, as much as I love castile soap, it makes this spray a little gummy. Instead, I use a very simple dish soap called better life, but you can use anything as long as it is free and clear of chemicals and castile soap.
) After removing crumbs, or VERY stuck on gunk, simply spray on surface and wipe clean. It cleans, it disinfects, it shines.
) If area is very soiled you can spray again. I usually only need to do once because I follow the step above.
) If area is SUPER soiled, spray and leave on a few minutes. Then spray again and wipe clean. Enjoy your clean & sparkling new surfaces! And if you’re looking for even more inspiration, try this DIY cleaner for wood floors or 5 Fresh Ways to Go Green in Your Home. Do you make your own DIY Cleaner? What’s in it? Love anything DIY and all natural. Definitely trying this out soon! Thanks for sharing! Awesome! Thank you son much for your tips! 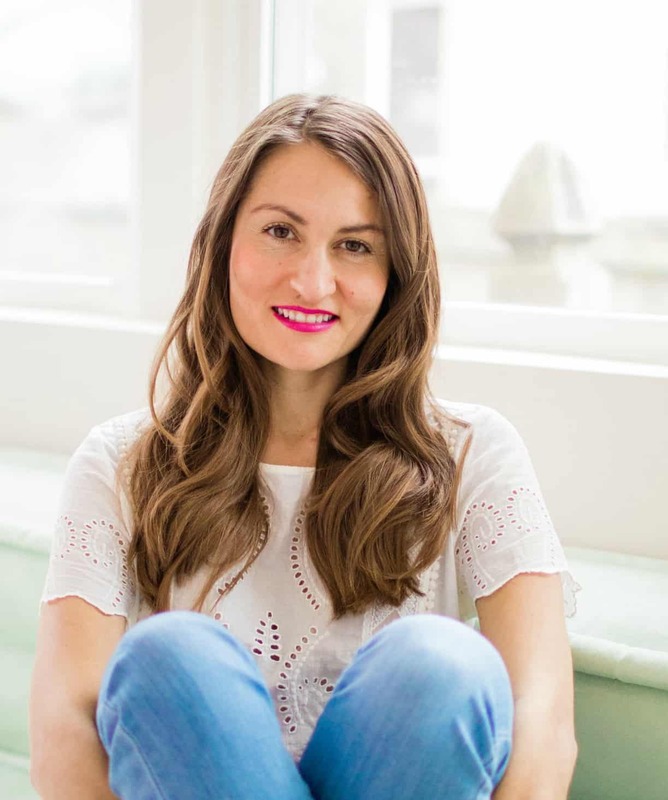 I love DIY Natural products, thanks for sharing! Sounds perfect! Do you think the Thieves dish soap would work? Yes, I do! That’s an excellent idea. Ah, love this. Pinning to remember! Ahhh… I need all the help I can get in the house cleaning area. Well, I really need a housekeeper but, that isn’t in the budget. I love homemade cleaners! I will need to try this one. Thank you for sharing! I just started using some essential oils. This DIY sounds easy enough and I’ve heard good things about Thieves. 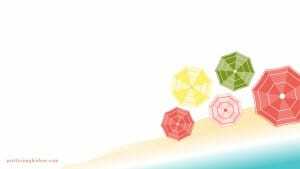 You will love using EO’s for so many fun projects! And yes, thieves seems to be very popular, but I also like to use Deep Clean from a different company. Both great! 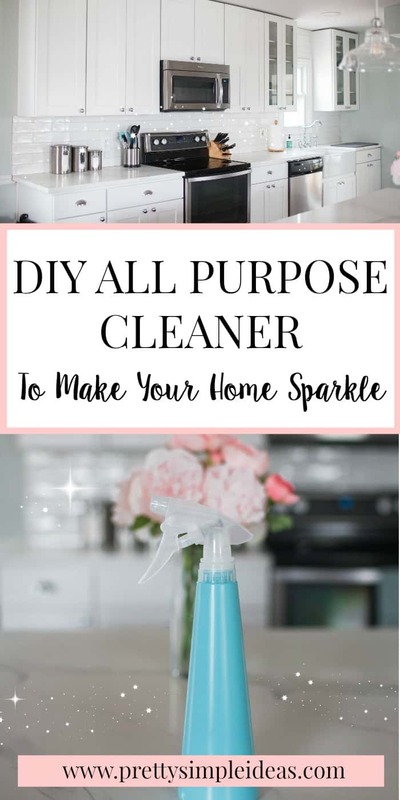 I love this DIY cleaner, and the pinnable image is so pretty! I love how you added the sparkles! haha I had to, right? recipe. Thanks for sharing – needed! What a great recipe, I tried it this afternoon and it works great! Thank you so much for a cleaning supply I can add to my DIY options. Yay I am so happy you tried it already and that it worked great! Just made something similar but not with essential oils. Off to add some! Oh I love the idea of a DIY all natural cleaner with Little’s and Pets in the home. I will definitely be giving this a try! How great! I need to try this! I’ve been looking for a DIY all-purpose cleaner, because the ones you can buy at the store have so much chemicals in them! I’m not surprised that the chemicals in cleaners are so bad for your lungs. Whenever I used spray all over the shower to clean, I could feel it in my lungs. I switched cleaners after that, but it’s probably still not as good as your natural recipe. I definitely need to make some of this! Yah I can definitely feel it when I breathe in those cleaners too. This is definitely a clean version your lungs will appreciate! That is so crazy how bad breathing in the fumes is for our lungs. 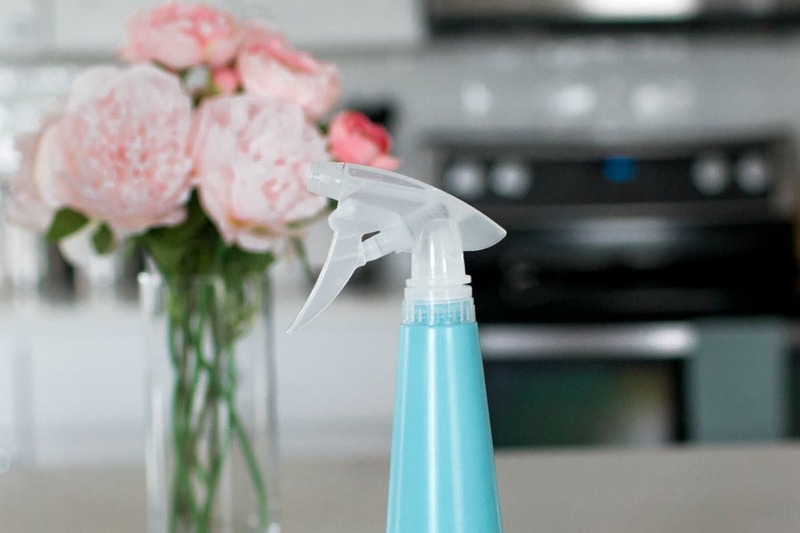 I’ve been slowly trying to get more natural products in our home, and this cleaner is a must. Thank you! Oh this sounds so great! With two young kids I hate how many cleaning products have chemicals in, but I still need to clean the house! I’ll give this a try! Squirt bottle filled with water and 3tbsp Dr. Bronner”s peppermint castile soap spray away. The soap eats away the exoskeleton and the scent is supposed to be a deterrent. It works great at our house. Use it to clean kitchen counter, surface and floors where you see ants. Send the kids outside in summer with their own squirt bottles to spray the foundation and other places they find ants near the house, wood piles be mindful of garden flowers. My daughter loves this “job! I do love my Dr. Bronner’s soaps too!